Biotin for horses is important as it is a key ingredient to naturally promote and maintain the growth of healthy hooves. nutrahoof is a high strength formula, which provides a novel and natural alternative for equine hoof care by providing a unique support for horses. Biotin is a key ingredient in nutrahoof, a nutritional supplement for horses suffering with hoof related conditions. 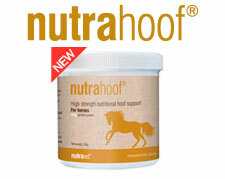 nutrahoof helps to support healthy hoof formation, which reduces problems such as cracked and brittle hooves. The unique formula contains very high levels of Biotin and over natural ingredients, such as Zinc and Vitamin E, which boost hoof keratinisation and minimise inflammation. The high strength formula aids health hoof growth and structure. If you’re looking for biotin supplements for horses, then nutrahoof is recommended by vets throughout the UK as a high strength natural hoof support. nutrahoof contains a unique combination of high strength natural ingredients that have been specifically formulated by vets -s pecifically for horses.